CREED II.©MGM / Warner Bros. Entertainment. CR:: Barry Wetcher / Metro Goldwyn Mayer Pictures / Warner Bros. Pictures. LONG BEACH, Calif.—The filmmaker and stars of “Creed II” were on hand at ComplexCon, an annual three-day festival that brings pop culture, music, art, food and fashion together. They were there to promote the boxing film sequel set to debut Wednesday, Nov. 21. The cast, the director and the stars’ physical trainer took a moment to play the “Creed: Rise to Glory” video game at the “Creed II” booth that resembled a boxing ring and gym. The audience, comprised of film journalists and fans alike, also got a chance to learn more about the new film as the cast stepped into the boxing ring for a question-and-answer session before there was a journalists-only press conference. 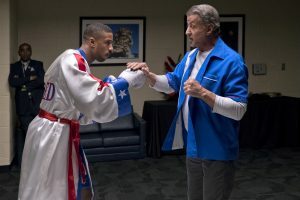 Following in the footsteps of the “Rocky” franchise, “Creed” has picked up the mantle of delivering boxing movies with heart. 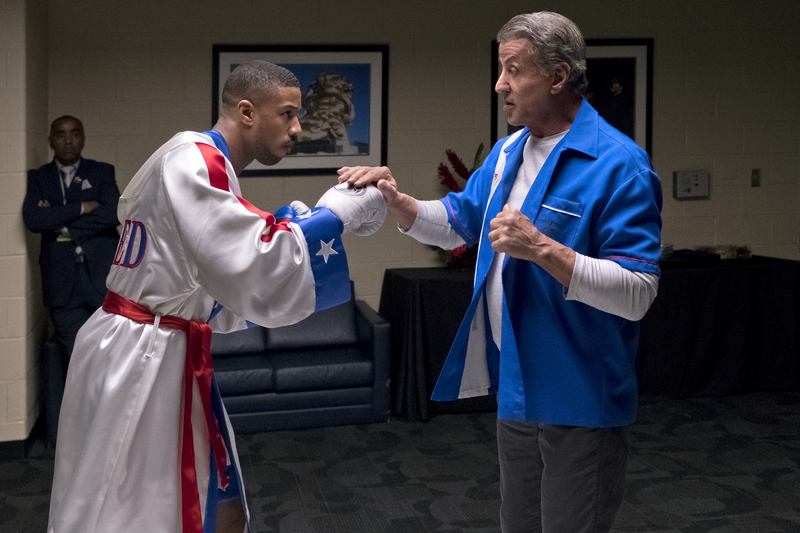 The original “Creed” debuted in 2015 and put star Michael B. Jordan on the map. In the highly anticipated sequel, Jordan returns along with Sylvester Stallone (reprising his Rocky Balboa character), Dolph Lundgren (reprising his Ivan Drago character), and introduces Florian Munteanu (as Ivan’s son, Viktor). The sequel follows the life of Apollo Creed’s son, Adonis Creed (Jordan). As Rocky (Stallone) takes Adonis under his wing, the younger Creed faces yet another formidable opponent in the boxing ring, Viktor Drago (Munteanu), whose father, Ivan, delivered the fatal blow in the ring to Adonis’ father years earlier. Coming off the success of his leading role in Marvel’s “Black Panther,” Jordan took on more than simply the character of Adonis Creed in the new film. He also is an executive producer on it. He admits that producing a major studio film was a learning process for him, and he believes a team-approach works best. Jordan was joined at the press conference by director Steven Caple Jr., Munteanu and physical trainer Corey Cailliet. Caple Jr.: Following up with what these guys created, we wanted to make sure that that films held up. I mean that’s the big question. Everyone’s coming into a sequel and, man, we love the first one. We wanted to make sure the characters are alive and that the human element to that story and you feel that heart at the end of it. And these guys put a lot of heart into it. I basically got hired last year to do it. Mike and Sly, we sat down to talk about the story and how can we naturally progress from the first one. I think we really hit the mark. We got multiple layers and it still feels fresh. And it’s still keeping that thing alive that you love about Rocky. Q: Michael, what’s your perspective on where “Creed II” stands? Jordan: For me, it being my baby, in the sense that I want it to stand on its own two feet. It’s kind of like allowing Adonis to have his own world. His own tribe. His own family and one that we can build upon. And to see this character grown and to see what young love is like. What it was like for a young millennial to be in love and also to be professionals? And to have their own careers to be successful in their own right. Where’s the give and take and how do you compromise in the relationship etcetera, etcetera? Those are the things we wanted to build upon as a young black not having his dad in his life and trying to figure what it’s like to be a man. What it means to be a father? Having his own family and what that looks like in Adonis’ eyes. And you have the legacy and nostalgia of “Rocky IV” with Apollo Creed and Drago. Having their history and their tension and drama carry on through their kids. Q: Corey, there’s a scene where Michael’s Adonis character is running down the street in New Mexico where he’s training. His body looks bigger than it did in either “Creed” or “Black Panther.” How did you get him in that level of shape to square off against that beast (Viktor Drago) and make it look realistic? Cailliet: To go back into training and not knowing what the future would hold as far as movie wise, we started the building blocks from “Creed” and started the building blocks from there for “Creed II.” I was like we’re going to have to make him bigger when we found that he would be up against a kill monger. We didn’t know what the script would be for “Creed II” so I was hoping that we’ll get it so it would have range. What I mean about range is that I don’t have to make him small. I’ll make him big. We say Flo (Drago), that’s where we got to go. I didn’t want a David versus Goliath. I wanted a Goliath versus Goliath. We did a lot so we could grow into the movie. You see Mike progress. (There’s) the intensity of the script. You see how his body changes. A lot of things we did in the movie we did in real life as well. Q: Michael, what do you think mentally has changed in you from the first film going to into the process of this film? Q: Flo, tell us about your journey coming into this project. Munteanu: When I first knew I got the job, Steven immediately told me what he expected from me. He made it clear he didn’t want just a beast. I wanted keep the emotional side because we already have so much emotion going on in the Creed side. He wanted to keep the people even on that (Drago) side. From my real life—the bad moments, the negative moments counted for that character because the character was so dark and so deep. There’s a lot of drama and emotions going on Drago’s side and, obviously, a lot of pain. My movie father feels a lot of pain because he got hunted out of his country. Everybody left him and he wants to redeem himself so the solution for getting everything back is his son. Like what Mike said before, that’s not our problems, right? It’s their problems. Two legends have their problems. It’s a new generation. Everything my character wants is to make his father prouder and I really could connect to that goal because family is very important to me. It means everything. It’s about family. Boxing in this movie is secondary. I can’t wait for you guys to see it. Q: Steven, what the set was like? What was it like controlling the set? Caple Jr.: It was different. There was a lot of drama like what (Florian) said. Shooting on set in the ring is really crazy. You got a lot of live audience. What got close to 2,000 people. Once you call “action,” the hard work that we put into it from working out, choreography, you got to let them be. (You’re) hoping no one gets too hurt in the ring because someone’s going to get hurt. When you flip the switch, you got people on their feet and yelling, like they’re watching a real fight. Mike’s done this before, so he’s had a lot of input in it. Sly was there. He’s been around doing this—like, it’s his eighth one. To have that type of experience, (Ryan) Coogler (the screenwriter) was a great help too. Talking to him on how to shoot a fight scene. to make sure it’s there. On top of that, adding my own spin on it. I watched a lot of fight films, karate films, anything. Q: Michael. Not only being an actor on this film, you’re also a producer. What was that like? Jordan: I’ve been growing and making goals for myself. It’s been growth from project to project. Experience to experience. I took a lot of things (on this film) ultimately that I want to be in the future. You know, a producer, director, actor and creator. You know, it’s a team effort. Everybody is vital to the outcome of the movie. So, if you’re not relying or empowering people around or next to you, then you’re doing yourself a disservice to the project. To be able to lean on—I mean Corey—a lot of mental motivation and physical motivation to stay focus. I mean to be able to rock out with Steven from a director aspect also a partner in crime. We got to be in each other’s pocket, on the same page every step of the way, where we have that communication where we say a few words from each other and understand each other. The same thing with Flo. He really came around this time and put in a lot of hard work and dedication so for me it’s the usual thing I do. I’m a team player. I like to build an ecosystem around me and that’s what this movie was for me.